Whenever we can, we eat all our meals in the gazebo, which is about five feet above ground level and right off the kitchen, the better to save us from flooding during storms. It is a cool haven on hot sunny days. 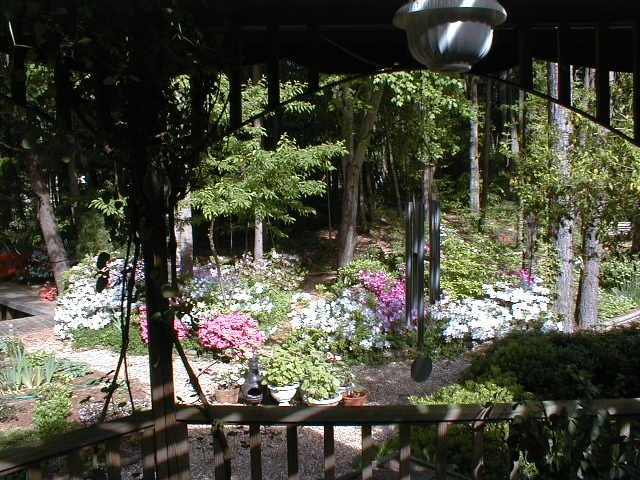 Ever since Isabel thinned the woods of large trees, almost daily, breezes from the water sweep through to fan us and tickle the wind chimes that hang above us. Such a treat. 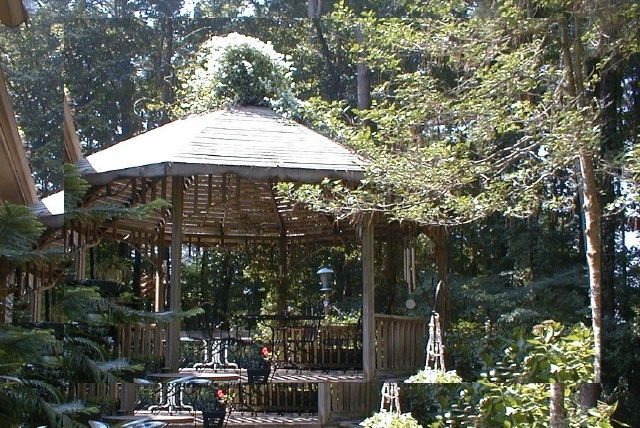 A sweet autumn clematis vine once blanketed the slatted roof of the gazebo with exuberance. On humid August afternoons we inhaled its sweetness, and on drizzly days its dense foliage became an umbrella that caught raindrops before they chased us inside. Much later, a confederate jasmine vine, would usurp the role of the clematis, but for many years, the clematis held sway. 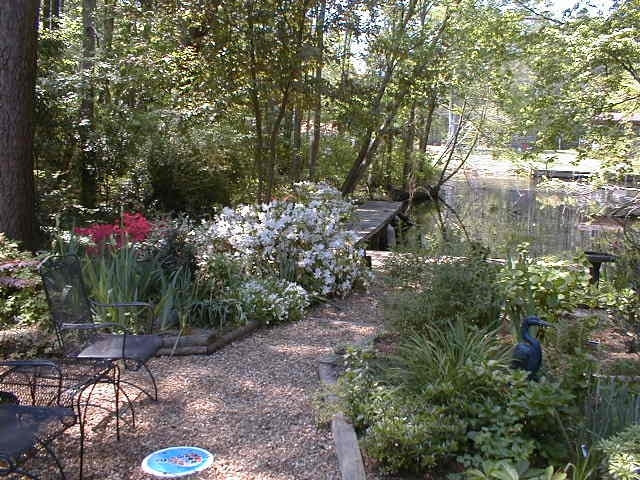 From the gazebo we can look down on wildlife and gardens. And a logjam. 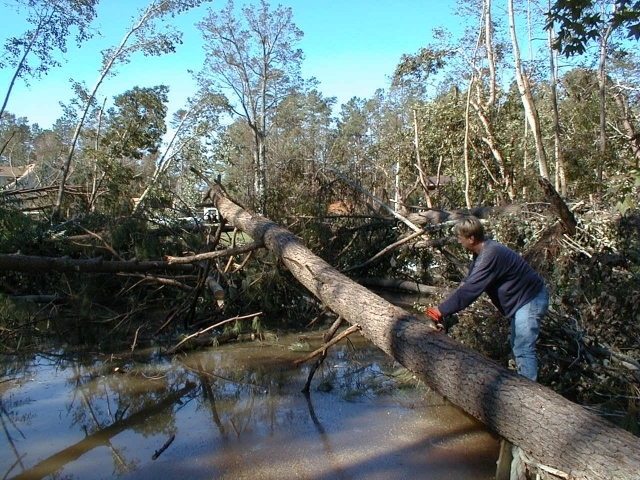 We despaired of ever clearing the logjam. No tree man would touch it. 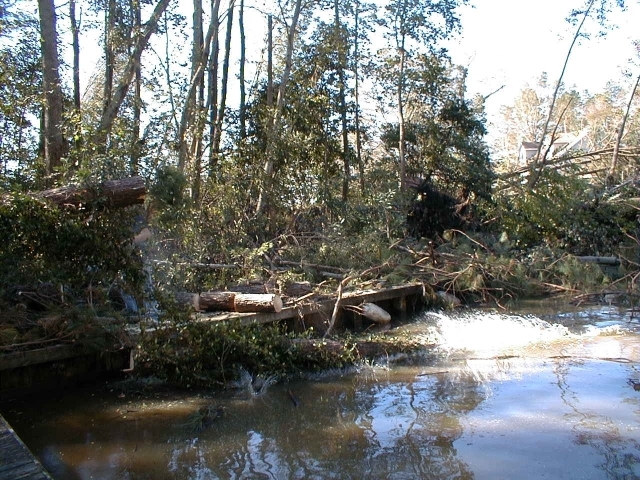 One wrong cut on the tangled logs and the bundle could be splashing and rolling in the water or on top of the logger. Too dangerous. Too much work. They didn’t say no. They simply gave us five-figure estimates, which immediately stifled the deal. 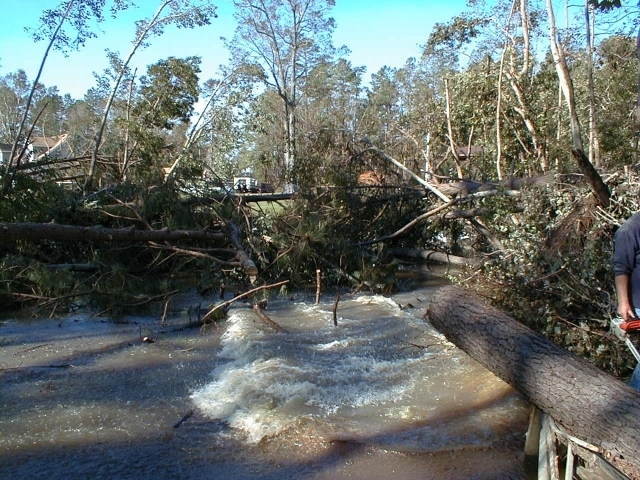 We assumed the logjam would always be with us. With quixotic humor we called it a playground for wildlife. When we opened our eyes and saw clearly, the playground became what it was, a colossal pile of logs. Most people gasped when they saw it. They understood our dilemma and they sympathized. Somebody came up with the idea of hiring a barge and pulling logs onto it. Interesting, but the logistics of such an operation were beyond us. From time to time, Bob would cut away large broken limbs that hung over the water. One neighbor told us that leaving the logjam in our private slip was dragging property values down. Never mind that neighbor. 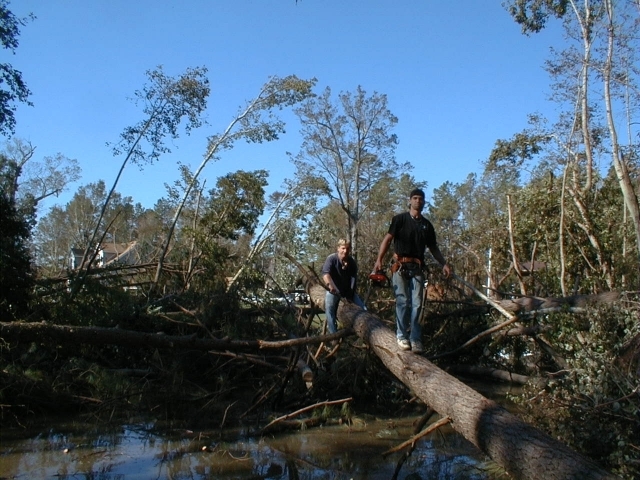 One of the finest things to emerge from this debacle was the kindness so many people showed to us: neighbors, friends, loggers, helpers, aid givers, even insurance adjusters. They simply took a look at the yard and wanted to help if they could. 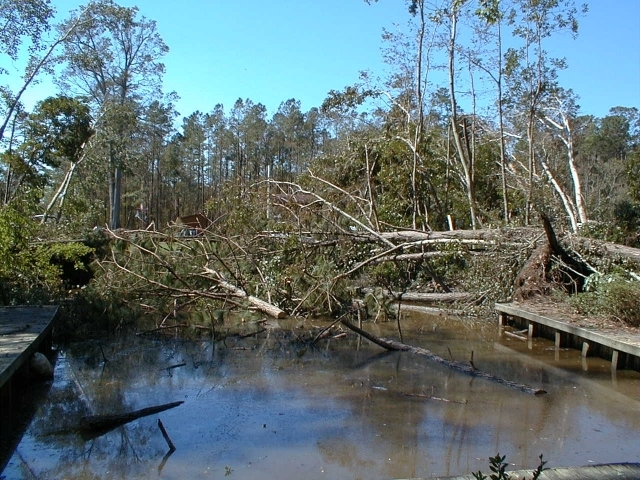 The Texas Tree Man refused the slip-job, but he went out on a limb, literally, to cut several large trees that straddled our dock. They rolled and splashed and bobbed about in the slip, so we were finally above to walk around the dock as long as we paid attention and didn’t plunge through shattered planks. Eventually these freed logs would sink and become underwater playgrounds for striped bass and schools of fish that the great blue heron would occasionally try to nab. The Texas Tree Man never billed us for this work. But sympathy and band-aids would not fix the mess. We were stuck, until one day a neighbor brought around a nice young man who had a plan to remove all those logs from the slip for a reasonable fee, say a couple of thousand dollars. It seemed too good to be true. Where was the catch? There was no catch. Our once dark woods lay to the north side of the slip. To the south was a tangle of vines, briar, and mostly supple young trees, impenetrable. Much of it seemed to be relatively unscathed by the storm. But then, how would we know? In fifteen years we’d never ventured into it. A year before we settled here there had been a lovely red maple rising about the tangle, but by the time we moved in, the maple had become a jagged stump, hit by lightning. And that was all we knew about this piece of our property. We called it our wilderness, even though it was postage-stamp size as wilderness areas go. As far as we were concerned, that land was strictly for the birds, the bugs, the snakes, the rabbits, raccoons and fox. These animals came and went from that direction pretty consistently. It was decided that our logjam would, log by log, be dropped into the wilderness. It took two men, a bobcat, a small motor boat, a chain saw and rope and chain. It took two days. They brought the bobcat overland across a neighbor’s property and trampled enough tangle to create a narrow break in the wilderness that ran down to the water. They sawed logs into manageable pieces and chained them to the bobcat, which then dragged them out of the water and up into the wilderness. A lot of strategy went into this operation. And balancing and roping and cutting and hauling. They reveled in the challenge. We admired their skill and the care with which they worked. We asked them to stop working just before the last two trees were to be cut free from their bank, floated off and hauled away. The pair looked at us with surprise. Are you sure? they asked. Why ever in the world would we want to leave any logs in the slip? We said the turtles would need perches for sunny days.